We love to travel, and that means we often find ourselves trying to figure out how to afford a vacation or weekend away on a limited budget. My good friend Jess decided to share some of her favorite tips with me recently, and sent over this post on 10 Tips For Cutting Expenses While Traveling. Since I know she does a good bit of traveling herself, I knew she would know what she was talking about. Going on vacation does not mean you need to deplete your bank account. While vacations are for splurging, there are some ways you can cut down on expenses while traveling. I wanted to share 10 of my best tips for learning to cut back a little, so you can save a lot. Pack snacks- One area you can save money in is the food department. Always pack your own snacks as often as you can. Pay with cash- Carrying around a credit card can make you feel like you’re rich and have more money to spend than you do. Pay with cash when you’re out shopping while traveling. Since we don’t like carrying around a lot of actual cash on our person, we have often used a pre-paid credit card, or stopped at an ATM early in the day to keep a set goal of how much we were comfy spending. One great thing about pre-paid cards is they are easy to load at nearly every chain store (including Dollar Tree and Dollar General) for a small fee. Travel with others– If you can stomach the idea of traveling with others, this is a major way you can save money. Splitting expenses is one smart move! Condo rentals are often much cheaper than hotels and offer kitchen and laundry right by you at all times! Ask for a discount- When it comes to saving money while traveling, never be afraid to ask for a discount. You never know, until you ask. Senior, AARP, Miltary and even Student discounts are the most common. Eat dinner earlier- You can save so much money by eating dinner early. There are always tons of “early bird” specials going on. Look up a menu online, before you head in to eat, so you have an idea of what the food will cost you. Use travel apps- If you want to save money on the go, download a travel app. Travel apps help you find the cheapest hotel, even while you’re on the go. Check the car before you go- While no one can predict what’s going to happen on the road, you can always be prepared. Have your car checked before you head out to avoid any major car repairs as you travel. We also recommend using a road side assistance program. We spend a little under $100 a year for our AAA membership. That gives us 8 roadside assistant uses. It includes changing tires, towing and even bringing gas. It has been one of the best investments for those random instances that happen out of nowhere. Stay with people you know- No one wants to invite themselves over, but in the name of saving money, stay with people you know (if they’ll have you). Parents, friends, siblings, college buddies. If someone has offered in the past, casually ask if you could stop in for a night or two. Always make sure that you return the favor and bring along a hostess gift of some kind at the minimum. Use Gas Buddy- Gas has to be one of the most expensive parts of traveling. Gas Buddy can help you find the best gas prices, all you need to do is type in your location. Be mindful of places that have lower prices, but require you to pay cash. You may want to hit an atm before you arrive to avoid service charges or a higher rate. Share meals- The average meal at a restaurant is enough to feed two people. Since food, lodging, and gas make up the majority of the cost of traveling, sharing a meal or two will help cut the expenses while traveling. Order an appetizer for kids to split and share an entree with your spouse. Often the appetizer sampler platters are around $10-$12 and will feed 2-3 kids more than enough. This ends up being cheaper and satisfies everyone. Also, don’t forget to check for coupons for all chain restaurants. Many will over BOGO or free kids meals. As you start planning your next vacation, these tips for cutting expenses while traveling will keep you on track! 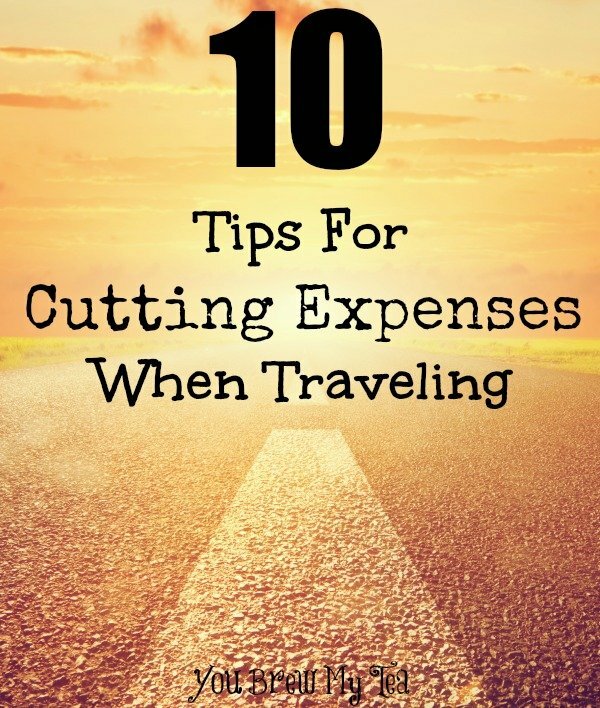 What are some ways you cut expenses while traveling? Great tips! I’d add to check with the local chamber of commerce or town visitor center to see what cheap or free activities are offered in the area you’re visiting. A filtered water bottle saves us a lot as well. Hubby likes drink mixes, and rather than spend money on water at every stop, we can fill the bottle anywhere without worrying about tummy upsets from different water sources.